You’ve spent your whole life working hard, and now is the time to take it easy and enjoy your retirement. Luxury senior living gives you the very best care with all the comforts of home. Renaissance Villages offers resort style living with spacious apartments. In addition, we offer exquisite dining services, and engaging activities and special events. Below is a guide of what to expect from Renaissance Villages in each of these areas. a kitchenette. Additionally, each apartment includes cable, a telephone line, and Wi-Fi. Most apartments also feature a private or semi-private patio. Memory care apartments are available in shared and private studios at both locations. Renaissance Village Murrieta also offers two-bedroom floorplans for memory care residents. All memory care apartments offer walk-in showers, cable, and Wi-Fi. Additionally, all residents receive weekly laundry and housekeeping services. Renaissance Village communities are also pet-friendly, and many dogs and cats already call it home. Each location has a dog park where furry friends can play. Renaissance Village Rancho Belago also offers apartments that open into the dog park. Renaissance Village Murrieta also has a walking trail behind the community. 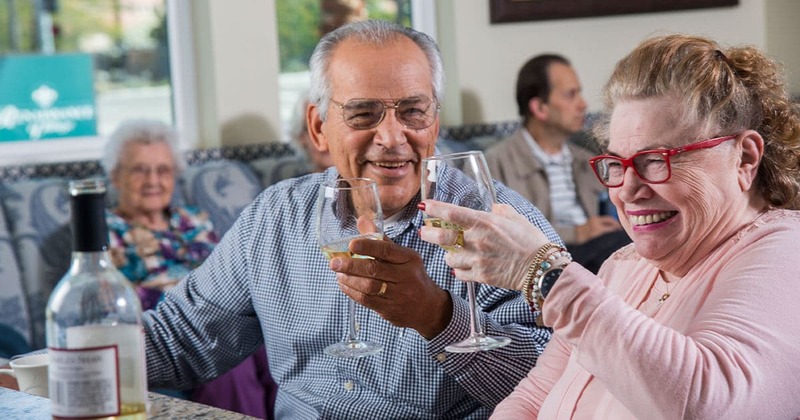 Renaissance Villages offers wonderful dining experiences at each location. Residents’ monthly rent includes three meals each day. The menu changes each day, and there are three different Chef Specials offered each day. Culinary trained chefs prepare each meal. Residents can enjoy their meals serviced by our professional wait staff in our restaurant-style dining room. The communities also offer a private dining room for celebrations and special occasions. Private dining is available at no additional fee. Contact concierge to make a reservation. Renaissance Village Rancho Belago features the Village Diner, which pays homage to the 50’s soda shops of our residents’ youth. Renaissance Village Murrieta features an Americana Bar and Bistro. Residents can socialize at these different spots throughout the community while grabbing a snack or beverage. Our chefs also offer food shows where they demonstrate various dishes and residents get to enjoy the results. Each community is custom designed to cultivate connection and socialization between residents. Residents can enjoy the company of family or neighbors in the comfort of our various sitting and activities rooms. Renaissance Villages tailor all activities and events with residents in mind. Each location utilizes a whole person holistic modality that engages our residents. Activities engage on a physical, cognitive, sensory, social, emotional, creative, and spiritual level. We offer activities involving art, music, games, trivia, and various exercise classes daily. Activities directors work with residents to create fun and engaging activities based on their interests. Residents provide ongoing feedback at our monthly Resident Council and Activity Planning meetings. Each location also plans monthly special events that embrace the various holidays and celebrations that residents enjoy. Events such as our annual luau, Oktoberfest, Thanksgiving, and Christmas to name a few. Celebrating the little and big moments of life coincides with the Renaissance Villages’ mission to create great days for residents. Opportunities for exercise are available each day. Renaissance Villages partners with Geri-Fit to offer their strength training program multiple times a week for residents. Each class is 45 minutes. Residents can take part from the comfort of a chair with one-on-one help. This program helps seniors increase endurance and strength, which in turn increases their mobility and independence. Both assisted living and memory care schedule outings for fun and stimulating activities outside the community. Excursions include visits to restaurants, aquariums, petting zoos, movies, casinos, shopping opportunities, and more. Residents can also make requests for outings at monthly Activity Planning meetings. Lastly, Renaissance Villages develops trusted relationships with great, local organizations. These relationships include organizations such as the Boys and Girls Club of America, Alzheimer’s Association, The Elder & Disability Law Firm, APC, and Geri-Fit. Each community hosts events and seminars with these organizations to provide helpful information to residents and their families. For these reasons and more, we encourage you to schedule a tour. So embrace the Renaissance Lifestyle and see the various amenities we offer for seniors seeking assisted living or memory care. Please note we also offer discounts to veterans. Call today to learn more about the services we provide and what’s available.